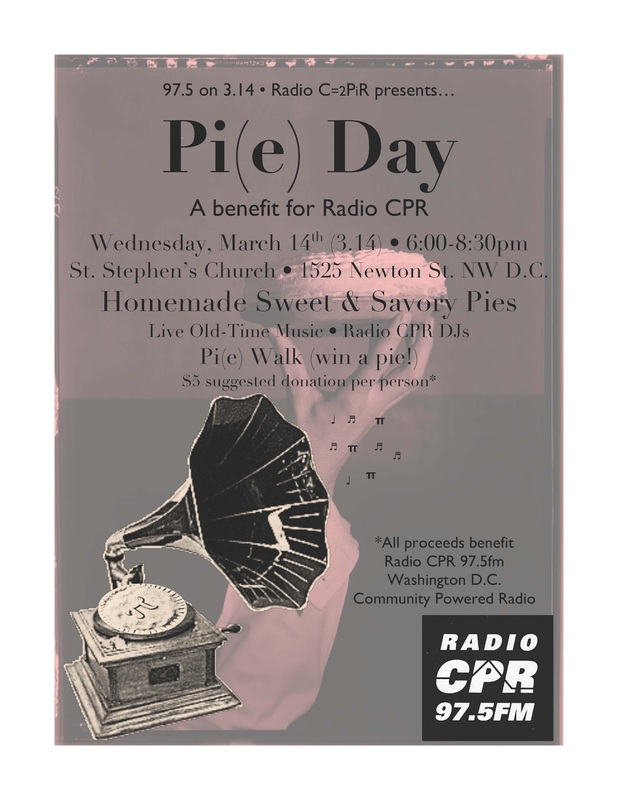 Nothing in the House: Radio C=2PiR presents...Pi(e) Day in D.C.! Radio C=2PiR presents...Pi(e) Day in D.C.! It's that time of year again Pi(e) Day is on the way! I'll be celebrating again this year, this time not in NC, but in DC, where in 2009 the House of Representatives supported the March 14th designation of Pi(e) Day. This year the event will be held as a benefit for Radio CPR, Washington D.C. community powered radio, and will all take place at St. Stephen's Church at 1525 Newton St. NW in Mt. Pleasant. Highlights of the party will include all-you-can-eat homemade sweet and savory pies, live old-time music, Radio CPR Djs a-DJin', and a Pi(e) Walk (walked in a circle of circumference 2piR) where you can win a pie to take home! You can find more information via our Facebook invite here. The menu is looking fine, with banana cream pie with salty bourbon caramel, vegan avocado pie (a Pi(e) Day classic, 3 years running), a bacon onion tart, classic key lime, and a few surprises all on the list. To find out what might be in store, check out our Pi(e) Day last year in Carrboro, NC (be sure to watch the video! ), and our 2010 celebration at Celebrity Dairy Goat Farm in Siler City, NC. Circle up to the pi(e) and see you there!